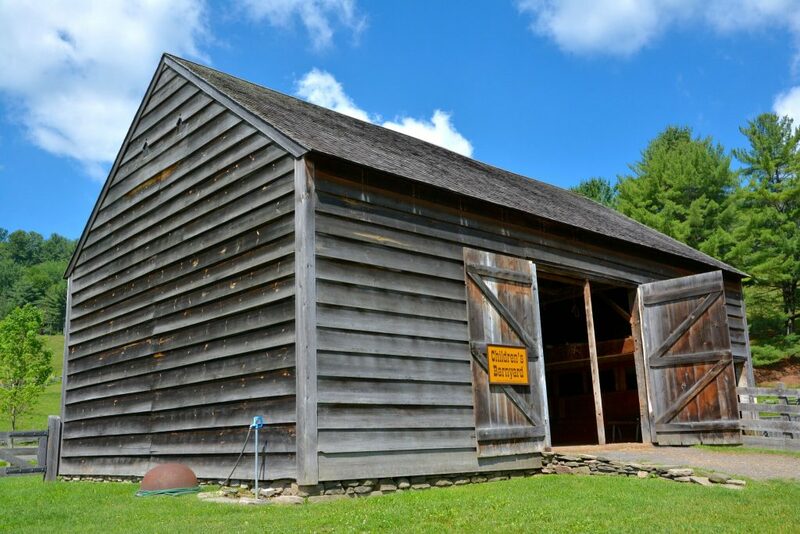 This barn is an English threshing barn, also known as a Yankee or Connecticut barn, which is typical of upstate New York in the late eighteenth and early nineteenth centuries. 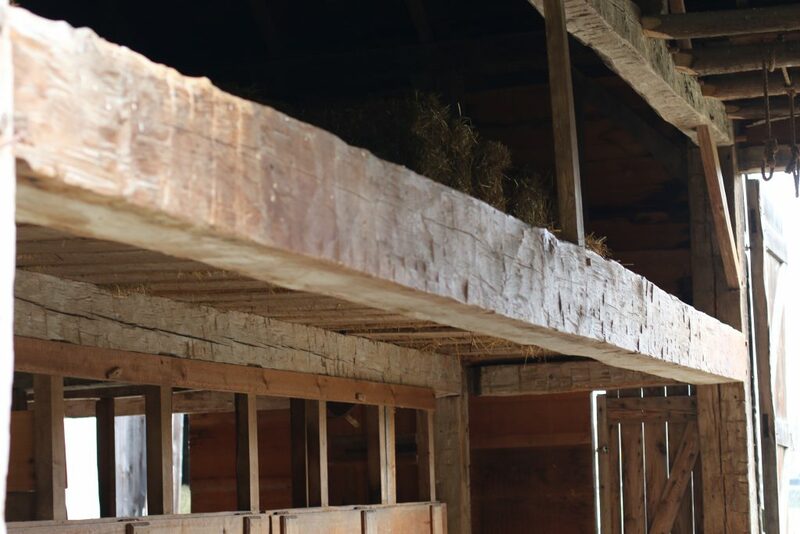 Sweet Marble Barn has a timber frame construction and three bays. 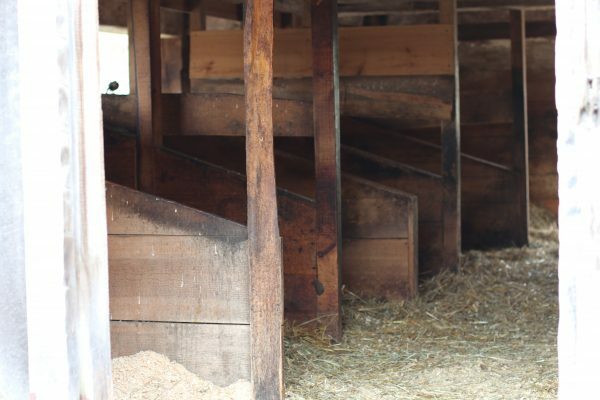 It has a center threshing floor and two side bays, one for the storage of grain and the other, with six stalls, for the shelter of animals. 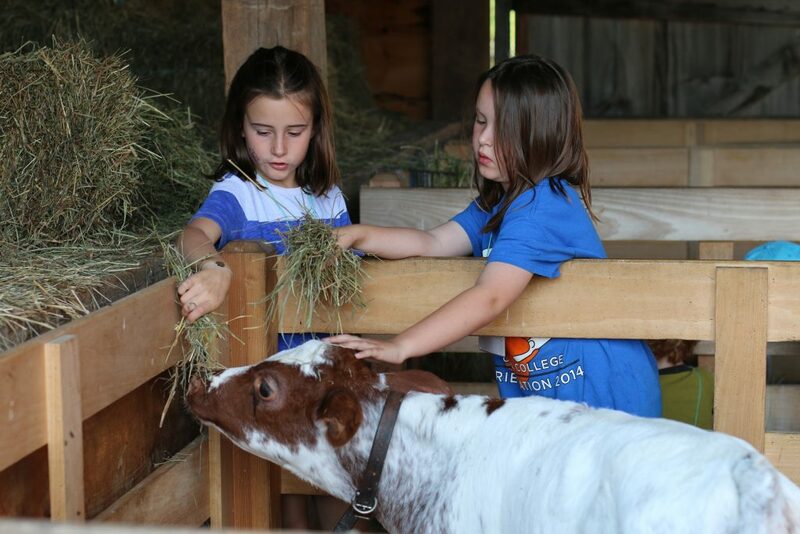 The Sweet Marble Barn is part of our Lippitt barnyard. 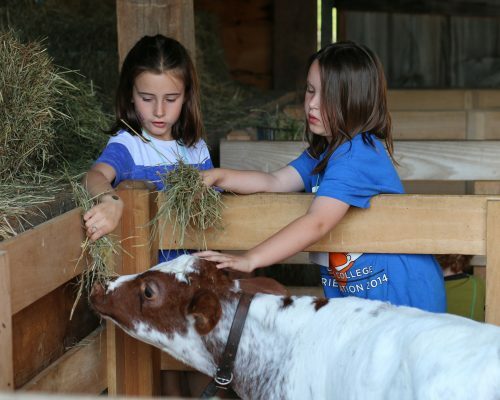 During the summer, the barn is used as the Children’s Barnyard with lambs, calves, chicks, and a rabbit. Sweet Marble Barn is also where we milk our cows. 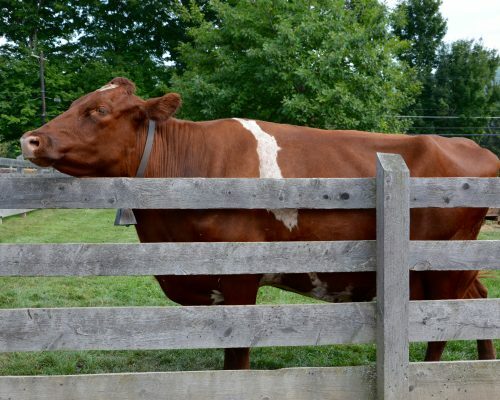 The Farmers’ Museum has several cows at any one time. 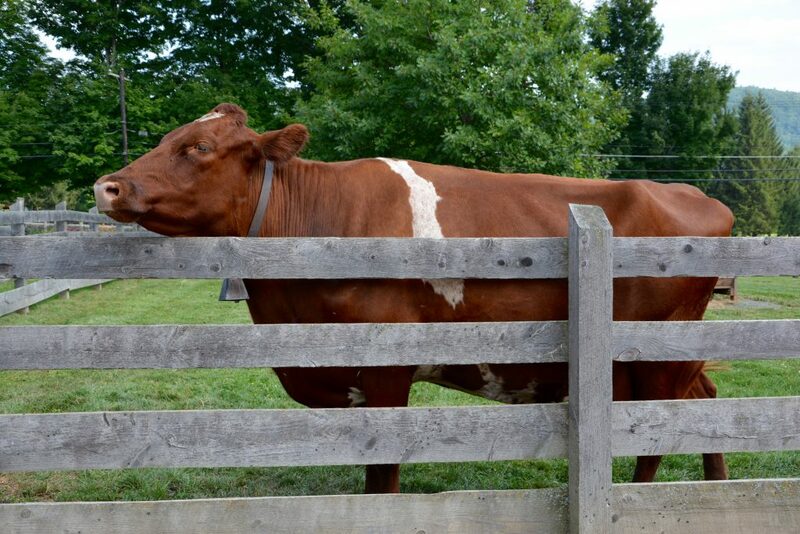 Specifically, we raise a heritage breed of Milking Short Horn. 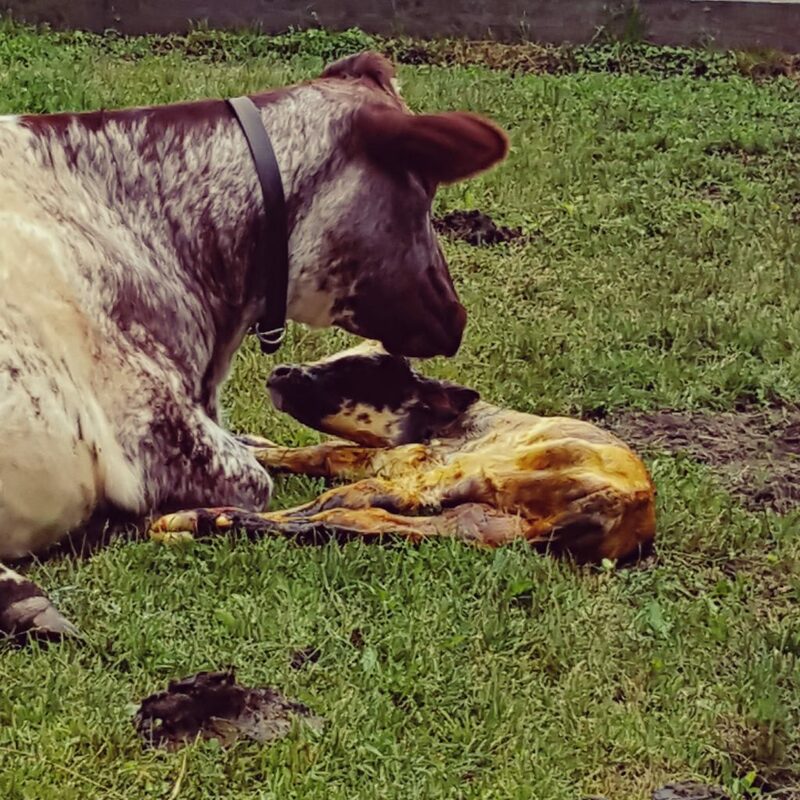 A cow can only be milked after it gives birth to a calf. 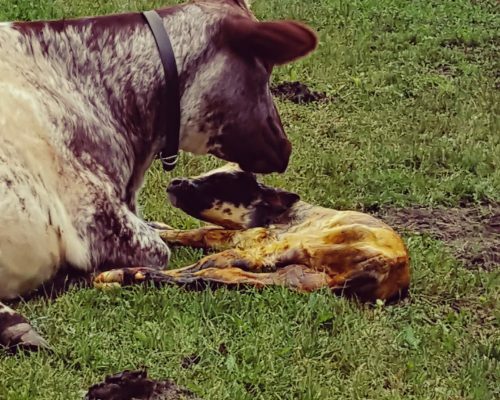 A cow produces milk to feed its calf. 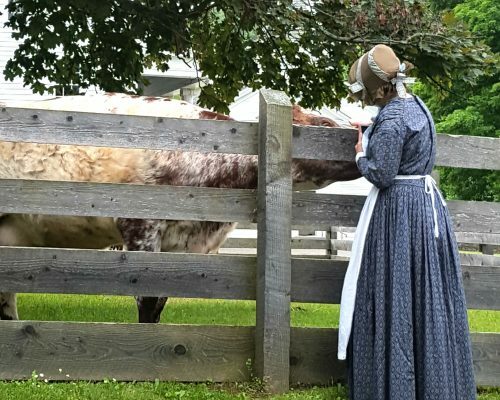 The Farmers’ Museum follows the nineteenth century practice of allowing the calf to eat and then using the extra milk in the Lippitt Farm House. 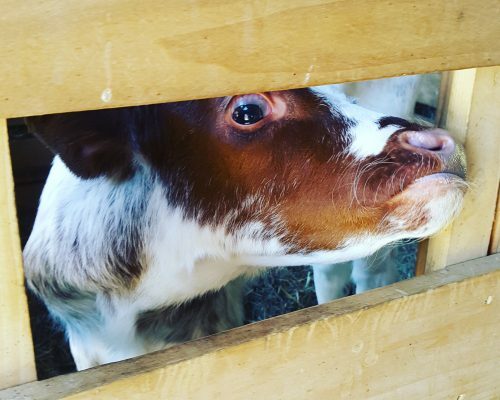 At the farmhouse, the milk is turned into cheese and butter. 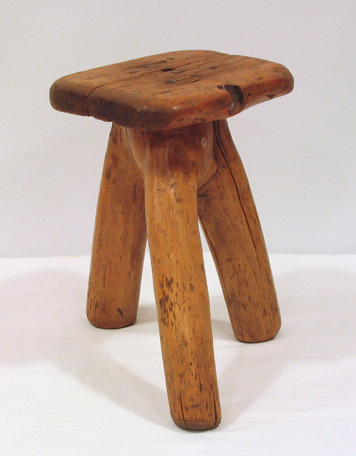 Milk, cheese, and butter are good sources of fat, and for a nineteenth century farm family, this fat was extremely important for a healthy diet. 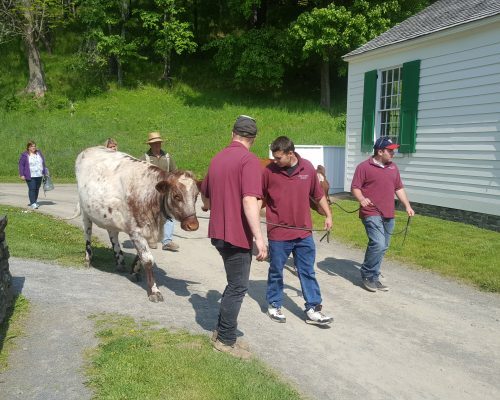 We raise a heritage breed of milking short horn. 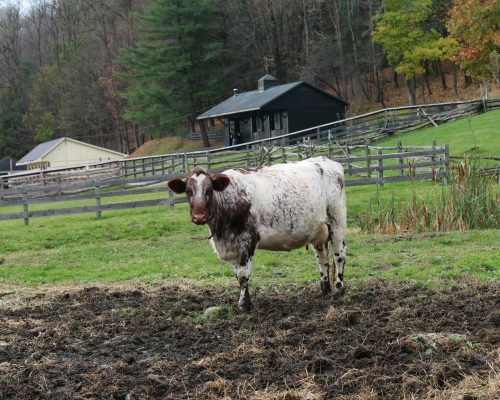 These cows are generally red, white, and roan in color and have good temperaments. 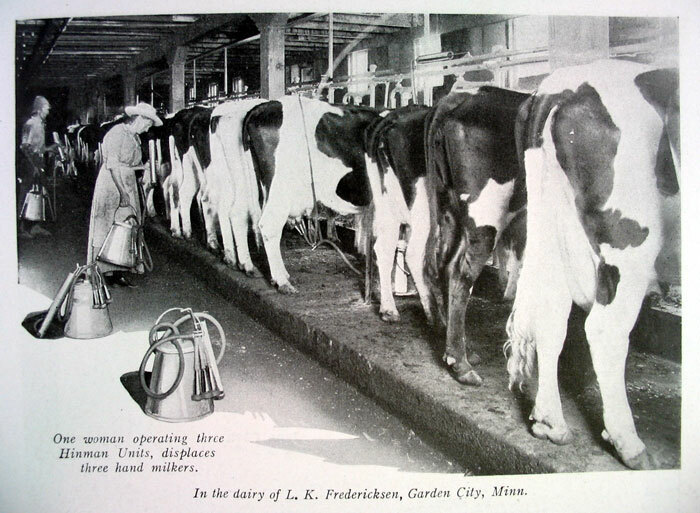 A good temperament is important in such a large animal, especially when hand milking. 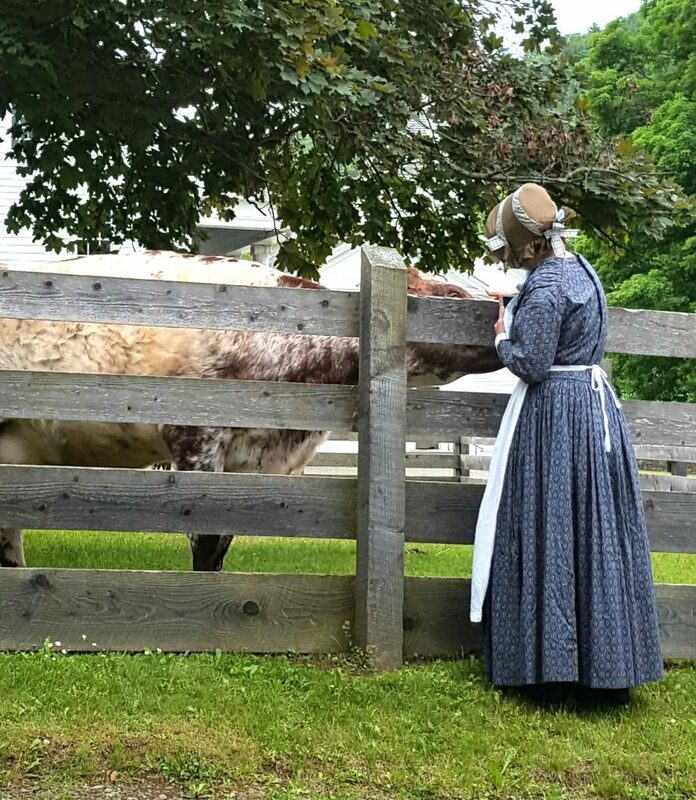 We milk our cows twice a day- once in the morning and once in the late afternoon. 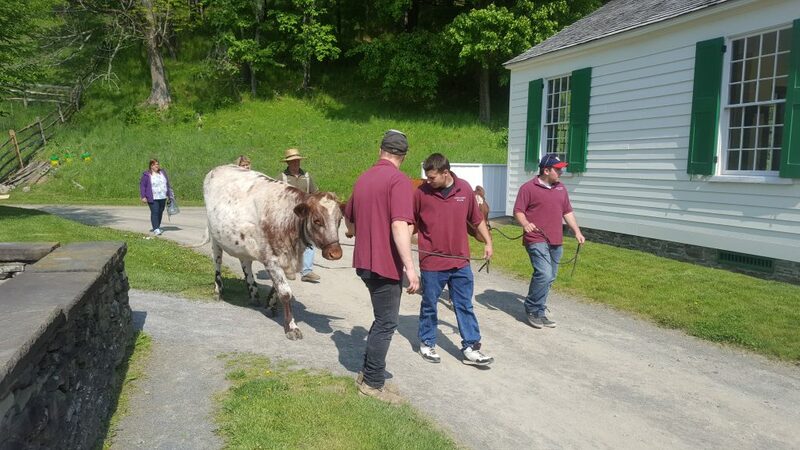 Gentleness is also necessary because we move the cows between pastures by walking them on a lead rope. 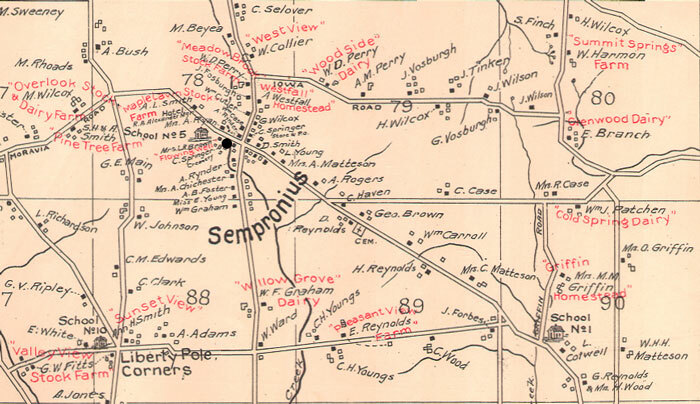 Milking short horns are still raised today on dairy farms. 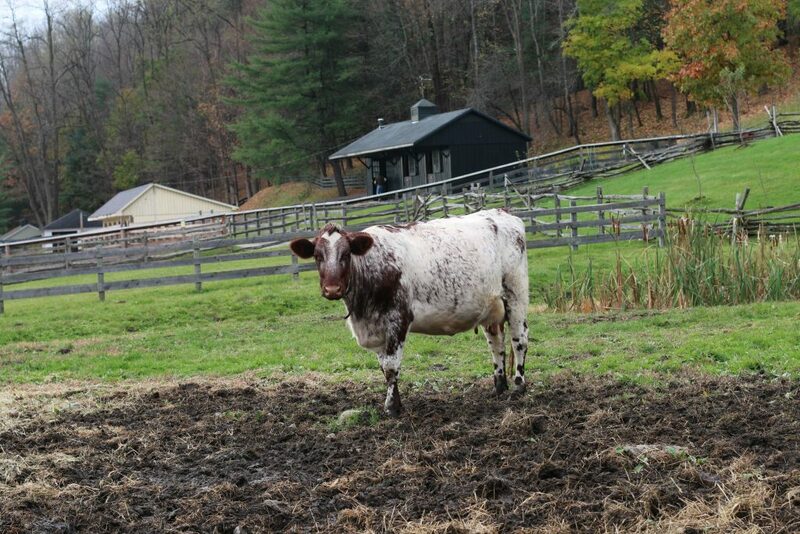 They are known for their beautiful color which is much different than the black and white of Holsteen cows. 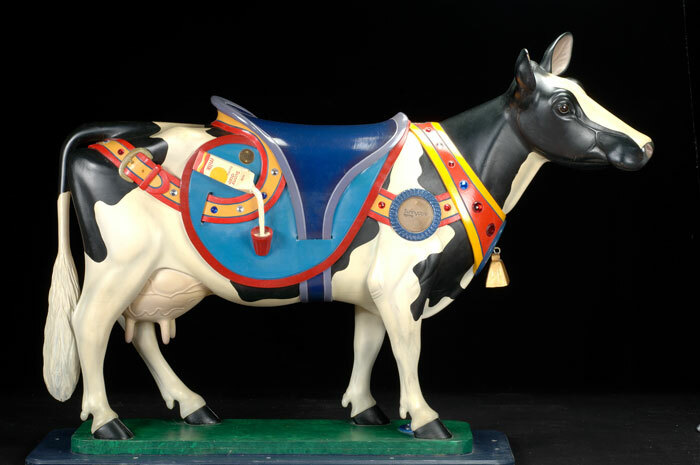 Short Horns are desired in modern dairies, as they were in the nineteenth century, for their gentle temperament. 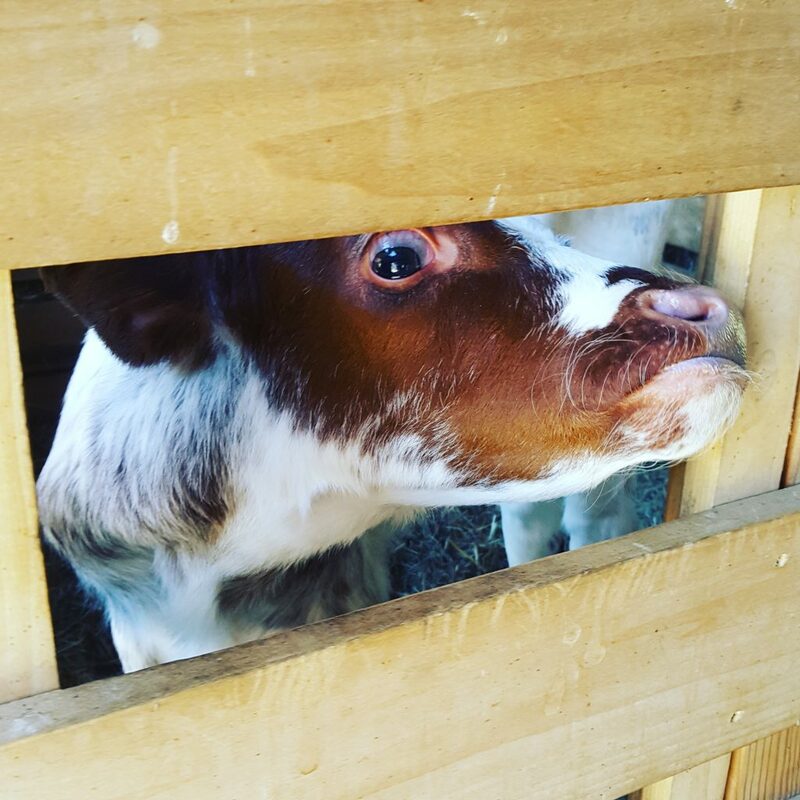 They are also hardy, generally healthy, and in a modern milking operation, can produce up to 15,000 pounds of milk a year. 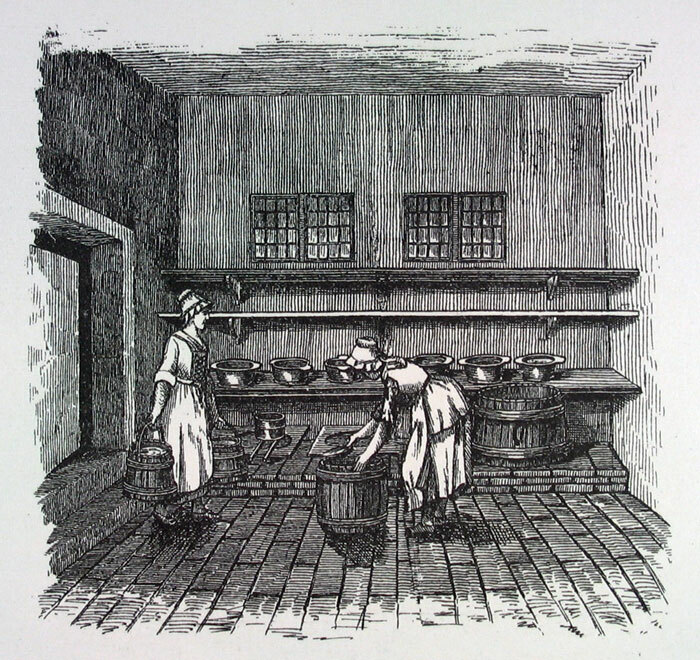 During the nineteenth century, the woman of the household was usually responsible for making butter and cheese. 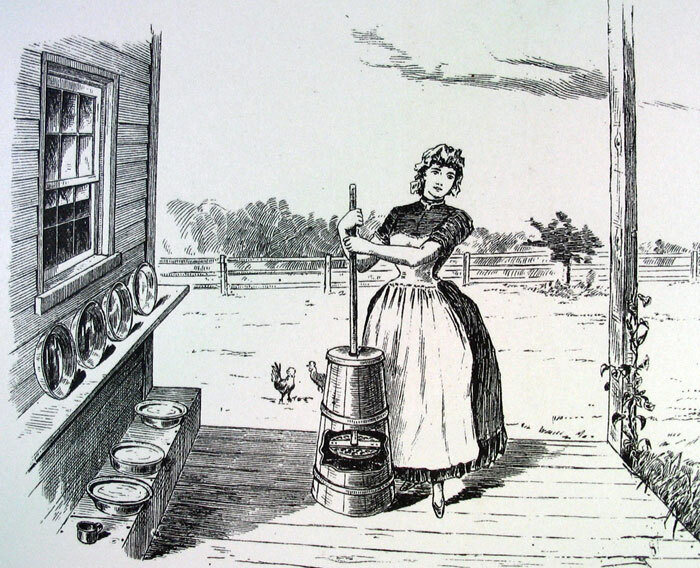 She would use cream, skimmed from milk, to make butter in a butter churn. 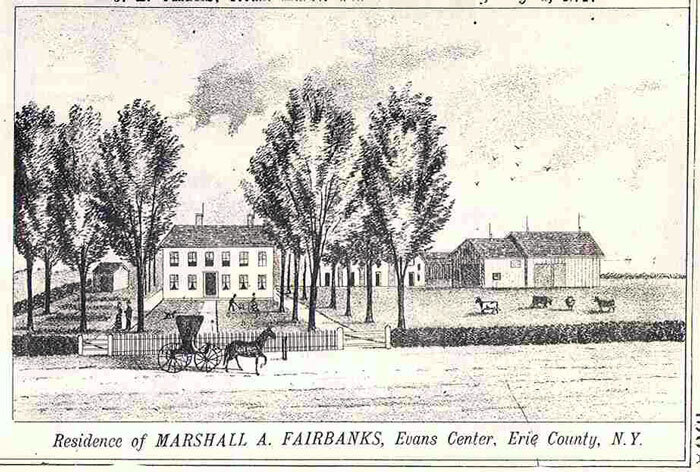 Nineteenth century farmers often received information about new technology and equipment from printed broadsides. 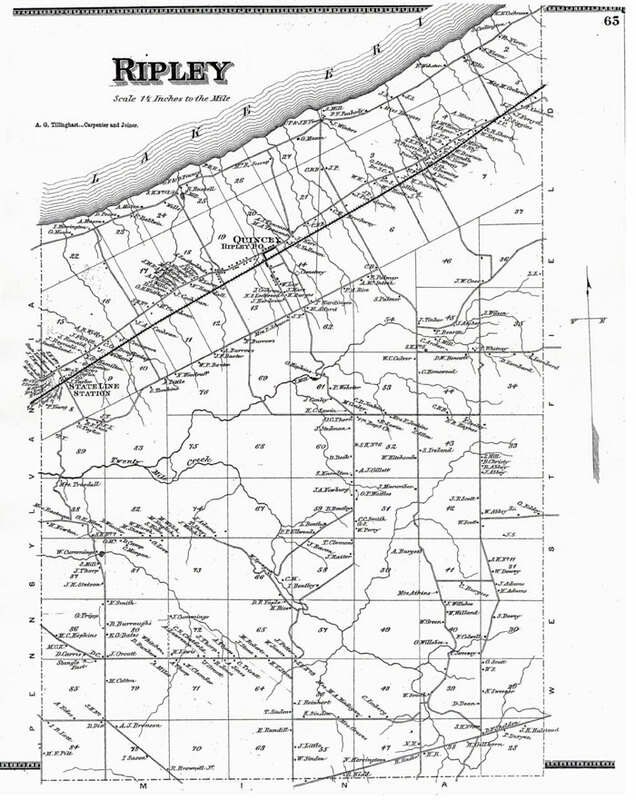 Broadsides were posters created for a specific purpose such as advertising, announcements, or information. 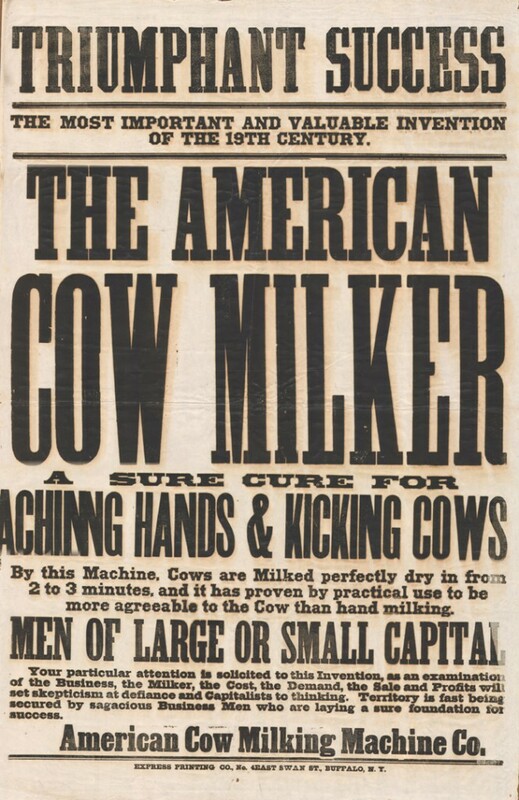 This broadside advertises the American Cow Milker, a milking machine from that time period.